"Hey, you can have a whole plantation!" he says, eliciting an audible snigger from the State Assembly Secretary, a relic of the colonial past. Aided by plainclothes orcs, the unruly primates evict the legitimate Speaker from the august State Assembly and install a pathetic usurper in his place. 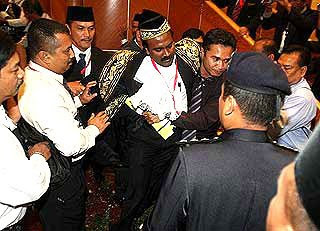 The rakyat will never forget this despicable act of thuggery and grotesque travesty of democratic principles! LOL! very ape..err..apt indeed! 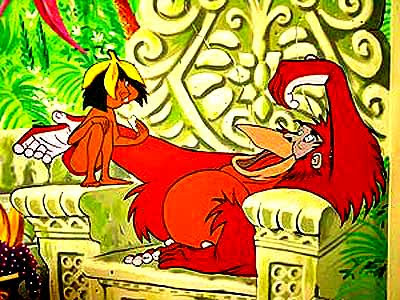 As I have said before UMNO stands for United Monkeys N Orangutans... There's no human at all in UMNO, only Monkeys and Orangutan trying to pose as civilized human. Anybody knows what species is Hee??? takes over = nazrin is talking NOW !! my #$% bini^&* has closed my credit card : @#$%^&* !! zorro unmasked GOT arrested in ipoh !!???????????????????????? 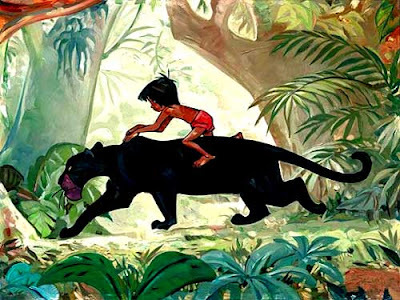 the mighty siva was dragged OUT of the dewan : in wat a city i'm still living !! any colour darker than BLACK, pls ! Thomas Su gave hee a rm50 note & she tore it into pieces : is it an offence ? hahaha ... nice one bro ... shall email you some "real" pictures in a while ..
Beware.... Invasion of Monkeys !!!! UMNO = Untuk Monyet NO Otak. What more can I say, friends? At least today's utter shambles shows up the mafia methods preferred by old-school leaders like Jibby "Pink Lips" Razaksasa. It's ok. By the way the acted, it's quite obvious these guys won't last. We can sit back and watch them self-destruct, even if the pressure applied ain't maximum yet. There was such a monkey who thought that it was very clever in stealing all types of fruits from an orchard all year round. One day, it saw a coconut filled with lots of sweets. It grabbed a whole handful. It was very excited about the catch. A farmer was rudely awakened from his slumber. He gave chaste. But by refusing to let go of the sweets. the monkey was forced to run with the heavy coconut. It was caught. That day is the next General Election day. They & their “Mercenaries” will always be in Denial & therefore resort to “Alternative Tactics” which can only be found in their Gutter Politics & Law of the Jungle “Holy Book”! 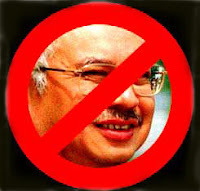 UMNO Baru is too deep in its 4th stage “Terminal Cancer” NOW, to be CURED”....Period! Through “Devine” intervention, UMNO, its Leaders & their Mercenaries are now “Outdoing & Destroying” each other with their “Power, Greed & Henious Crimes”. Every new day will be another “New Revelation” to reveal another “Truth” in its Self Destruct motion towards its “Demise”. Just give them enough rope to “Hang” themselves at every turn in their “Final” chapter. Moral of the story....when the PR Leader (Speaker) was under threat, where were the 2nd & 3rd line Leaders (ex-MB, etc) to provide backup, diversions, etc at the battlefront? If PR Speaker & ex-MB thought they had managed to have a "Word or Two" with Raja Nazrin to support them, then they were "Mistaken" as UMNO/BN has Raja Nazrin by his Orbs/Jugulars"
The PR Aduns were "Outmatched & mislead into UMNO/BN's TRAP". Never underestimate your opponents, especially when they play by their "Gutter Politics & Law of the Jungle" Holybook. Hello, UN guy Razali, what do you think of the human rights record in Msia? Have we bettered Myammar? What say you Antares ? is there any hope at all? at lot of comment have been posted about making the changes in the next GE. what is stoping them to declare emergency rule when they are wipe out in the GE? remember they control the mafia police and army! we are doomed.! nothing seems to improved. even the one we have are hopes on are not doing anything to help .I fear for the worst! 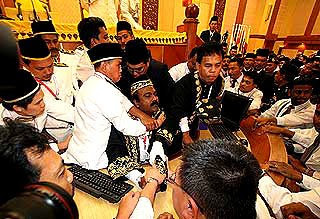 7May's BN's shameful fracas at Perak State Assembly will be etched in time till eternity ! Such thuggish moves can hardly boost confidence for foreign investment.
" ...if you want to work with me in FUTURE, respect my speech, understand !" wanted to stop it !! Democracy means much more than voting once in 5 years. Actually, it takes 5 years of preparation. And it is a multi-dimensional process. No point to win a election when it is merely a changing of masters, an Orwellian situation of "All men are equal, some are more equal". Voting is not a panacea, true. A culture of awakening is needed from the deep slumber of self-centerness in all the institutions and in the human heart. the prince has waited > 5 hours ! he should know the ugly truth , what can he do NOW ah !? AS our future ruler he should be prudent to act fast for his subjects! There is an old monkey who likes to talk big when his challenge is accepted he lost his balls leaving his old banana sweating. 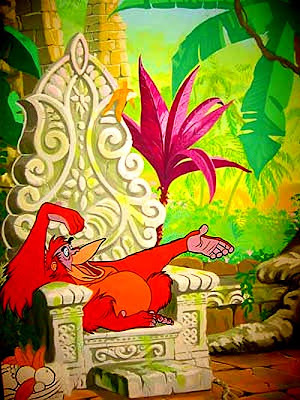 Since then not heard of this old monkey did he go deeper into the jungle to get lost? Love your story board and wicked humor! The Reign of Robber Barons Is Almost Over! ARE WE GETTING ALONG... OR NOT? Will Bush & Cheney be indicted?